You probably know of Italian lasagna, but did you know that the Greeks have their own version of this comfort food? 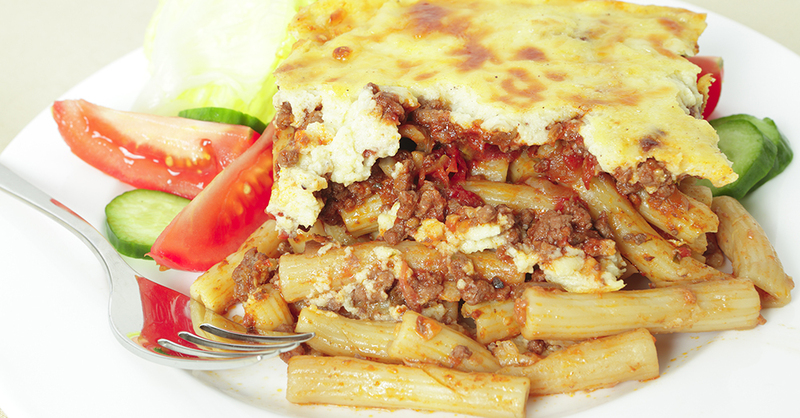 Called Pastitsio, this pasta dish is warm and filling, making it the perfect meal for a cold night. Basically a meat sauce-filled noodle casserole, pastitsio is typically topped with a creamy béchamel sauce and extra cheese to create a delicious, hearty meal. It’s simple to make and you will have plenty of leftovers, which is perfect for those weekday ruts when you don’t know what to make for lunch…pastitsio to the rescue! Preheat oven to 350º F. Cook pasta according to packaging directions, then drain, and transfer to a 9x13-inch baking dish. Heat oil over medium-high heat, then add the beef, lamb and onion. Cook until the meat is no longer pink and onion is softened and tender. Add garlic and cook for another 2 minutes. Pour in tomato sauce and season with cinnamon, cayenne pepper and 1/2 teaspoon salt. Stir together until combined and heated through, then add to pasta and sprinkle with 3/4 cup Parmesan cheese. Melt butter in a large saucepan over medium heat. Sprinkle in flour, pepper and 1/2 teaspoon salt, and stir until smooth and paste-like. Whisk in milk and bring to a low boil, cooking until sauce has thickened. 1-2 minutes. Whisk eggs together in a medium bowl and pour 1/3 cup béchamel in, whisking until combined. Pour egg mixture into the béchamel sauce and whisk together until combined. Lower to a gentle boil, and simmer for 2 minutes. Pour sauce over pasta mixture, and sprinkle with remaining parmesan cheese. Cover and bake for 20 minutes, then uncover and bake another 30-40 minutes, or until golden brown. Serve casserole hot and enjoy!